If you’re going to read No Choirboy by Susan Kuklin, you’re going to need to prepare your heart and mind. This book is rough, violent, graphic, and frustrating. But I’m hopeful it will change some students so I’m glad it’s going to be in classrooms this year. 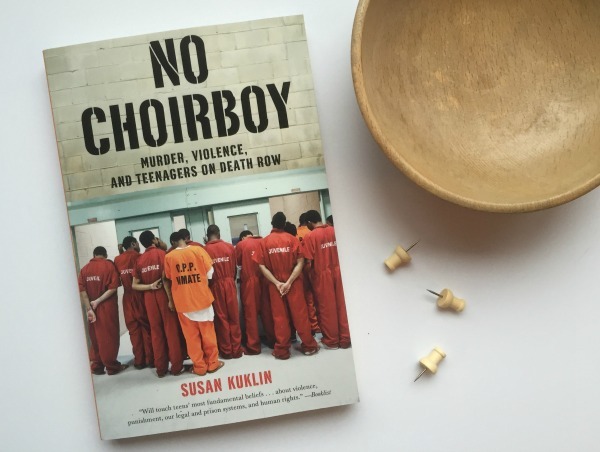 No Choirboy is about “murder, violence, and teenagers on death row.” I originally ordered it because our students need more non-fiction options that they actually want to read. I’m sorry Rosa Parks, but they don’t want to keep reading your autobiography every year. Our language arts department was failing to provide high-interest non-fiction novels to our students. Part of the problem is that there aren’t a whole lot of high-interest non-fiction books for young adults written, but that’s beside the point. My intention was that this book would help make the glorified world of gangs, violence, and guns less appealing to my students. Because truthfully, many of them live in world similar to the men in these books and I was hoping for some revelations. And I believe that can happen with these stories. Each chapter is a different death row inmate who was under the age of eighteen when he committed murder. (The law has since changed that no child under the age of eighteen, even if tried as an adult, can be sentenced to die if they were under the age of eighteen at the time of the crime…but you’ll need to read the book for more on that.) Kids that just made a single bad choice, listened to the wrong friend, or were at the wrong place at the wrong time, and in an instant their lives were changed forever. Their experiences on death row are eye-opening and disgusting. Their stories of regret and remorse and maturity will break your heart. And, I hope, teach some powerful lessons. No Choirboy by Susan Kuklin is a lot more than I planned it to be. It will definitely be in 8th grade classrooms, but it’s a little too much for the 7th grade. It makes you rethink our justice system and our society’s focus on revenge killing. It will definitely make you question our prison system. And that’s all I ask of a book I’m putting in kids’ hands: that it makes them think.